I had been positively stalking the New Vocations website and Facebook, with my heart set on a big, chestnut-with-chrome gelding OTTB who would take me to mid-level eventing. I knew it wouldn’t take too long for him to show up (New Vocations is so good at finding big yummy horses! ), but I still knew it was going to be a rough wait. 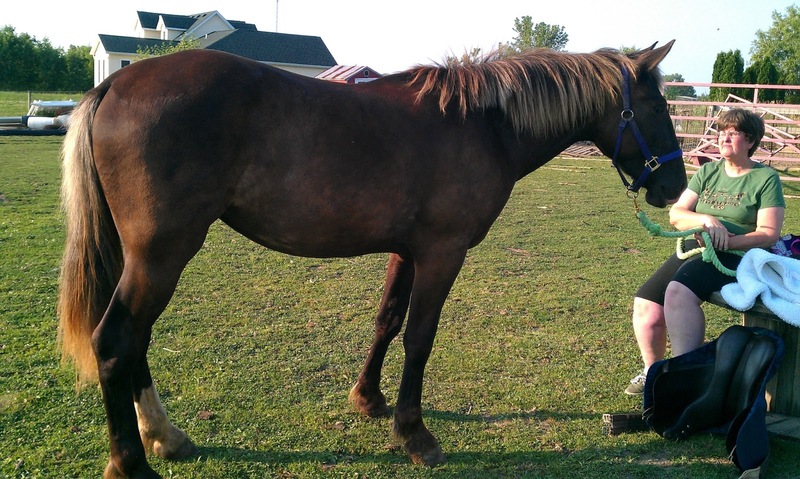 Then, Julie convinced me to go look at a Craigslist horse of all things – a draft cross mare, 3yo, who had been broken to the harness but otherwise not trained at all. The first day we saw her. She had a very nice trot. 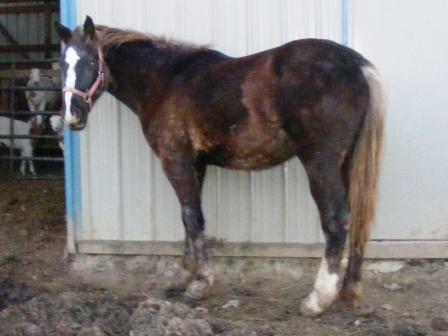 She had been extremely well-taken cared for (not a given when you’re talking about OTTBs). She was at the best possible age for me to buy her – just ready to be started, not old enough to know any horrible habits. She had never been stalled and had the body to back it up. Best of all – she would be mine to teach her absolutely everything. She was generally polite and gentle, but didn’t know how to cross-tie, let alone all the riding time a TB would come with. She wouldn’t come with all the potential crazy and problems a TB could have, and, when she was done, I would be able to say that I made her all by myself. Next > The Story So Far, Part 3: Success!